The Uni Pin Drawing Pen is a fineliner for artists and designers available in a variety of sizes. These pens are particularly useful for artists who wish to add watercolour washes to their sketches and technical drawings as the ink is waterproof once dry. 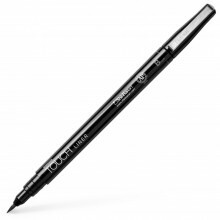 This is the Uni Pin Waterproof Lightfast Drawing Pen in Black, Brush Tip. Available in nine different nib sizes: 0.05mm, 0.1mm, 0.2mm, 0.3mm, 0.4mm, 0.5mm, 0.6mm, 0.7mm and 0.8mm.